#12-18 "The Game of Billiards" (Left) A step-by-step course in strategy, tactics and manual dexterity necessary for effective play. Includes definitions of billiard terms, general rules and scoring. Detailed instruction and practice lessons with diagrams and drawings. 165 pages, about 5 inches wide, 8 inches tall. $20. 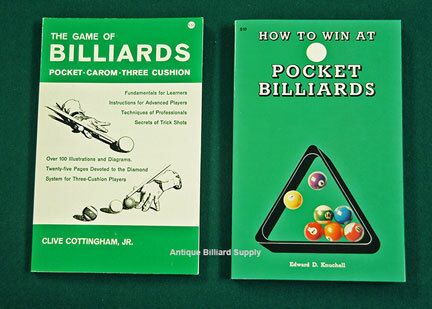 "How to Win at Pocket Billiards" (Right) A product of 35 years of research by the author, this volume discusses the various games of pocket billiards and then outlines techniques and exercises to benefit players of all skill levels. Explores specific situations that occur during a game. Includes 88 diagrams and 40 photos. 256 pages, about 5 inches wide, 8 inches tall. $50.